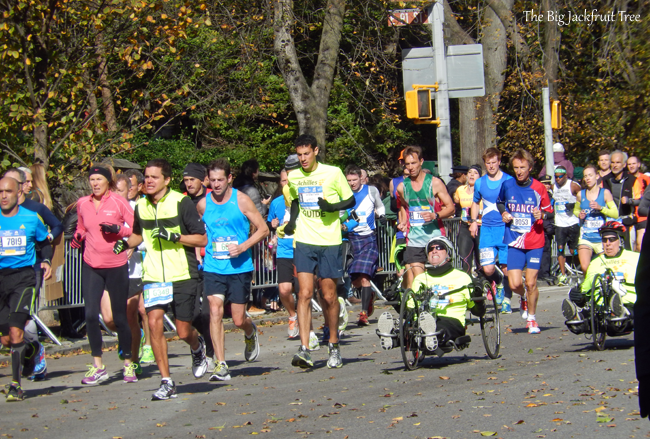 New York City Marathon… a not to be missed event! Someone recently asked me… what’s so special about the marathon? Why are people, generally not interested in athletics, so keen on running it? The easiest answer was ‘prestige’. Prestige and pride. The sense of accomplishment. The immense way it makes one feel good about oneself. It is not about the running – in fact, running is the least of it – it is all about one’s self perception. The discipline and dedication needed to get to the level of training required for a marathon is tremendous. And of long duration. To prove that one can adhere to the punishing schedules with the accompanying scarifices for as long as it takes, to oneself more than to any others… there are not too many achievements that compare, at least in my opinion. 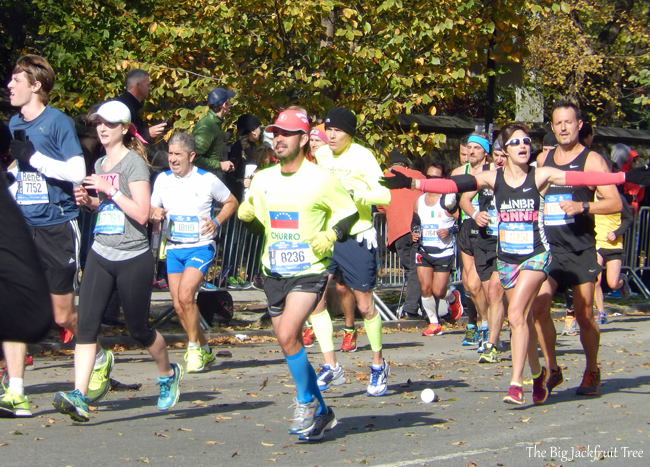 Spectators line the entire 26.2 miles – 26.219 miles to be exact – of the route the runners take, cheering them on. They bring placards and signs and personal messages to encourage the runners. The spectator involvement is so great that it actually amounts to a vicarious participation in the event. The energy of the crowd is palpable and contagious. I went there to see the event and take some pictures… and came back with a hoarse throat with all that cheering! 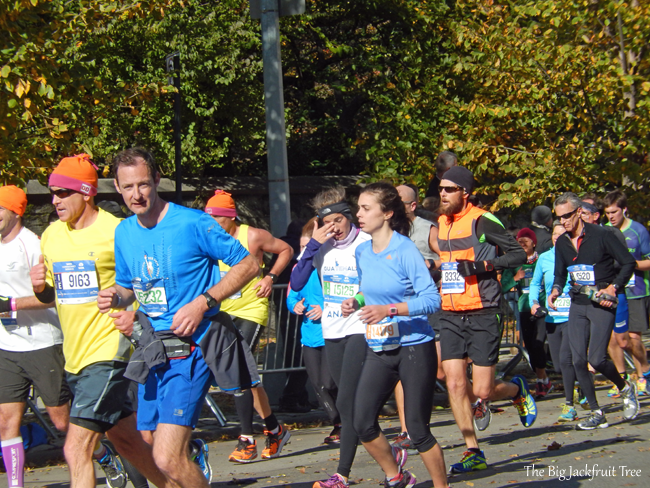 The New York City Marathon route passes through all five boroughs of New York City, starting in Staten Island and going through Brooklyn, Queens, Bronx (passing through Manhattan) and ending at the Central Park in Manhattan. It is held on the first Sunday of November. 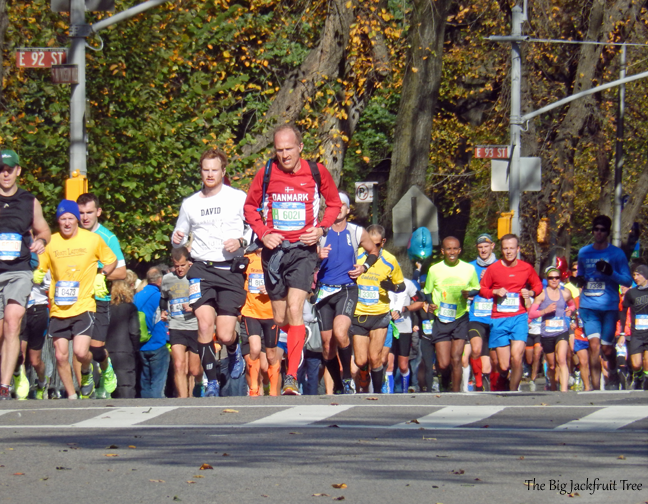 NYC Marathon has the largest participation among all the marathons run anywhere in the world, with both professionals and amateurs participating. 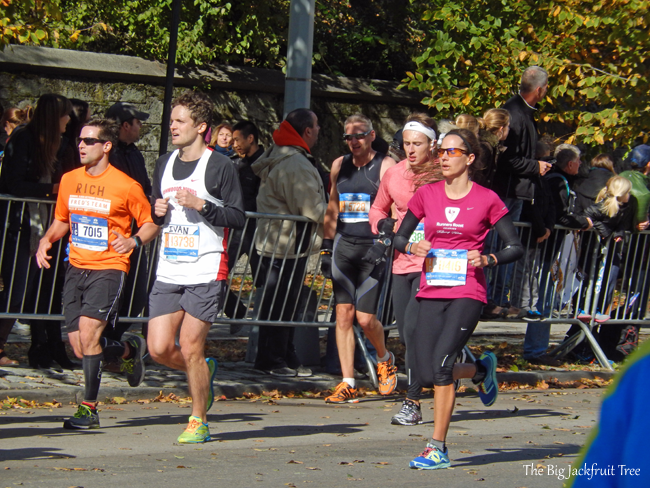 Anyone who will be 18 years of age or older on November 1, the following year can participate in the race. This year, 50,530 participants finished the race with an average time of 4 hours 34 minutes and 45 seconds. Wilson Kipsang of Kenya won the 2014 NYC Marathon, along with the $ 500,000 World Marathon Majors championship, with a timing of 2 hours 10 minutes and 59 seconds. The second place – with a difference of 7 seconds, yes… seconds! – was taken by Lelisa Desisa of Ethiopia. Among the women competitors, Mary Keitany claimed the first place with a timing of 2 hours 25 minutes and 7 seconds, just ahead of Jemima Sumgong by 3 seconds, both of them from Kenya. Mary Keitany placed third in 2010 and 2011, but hadn’t run in the race the last two years as she was on maternity leave. 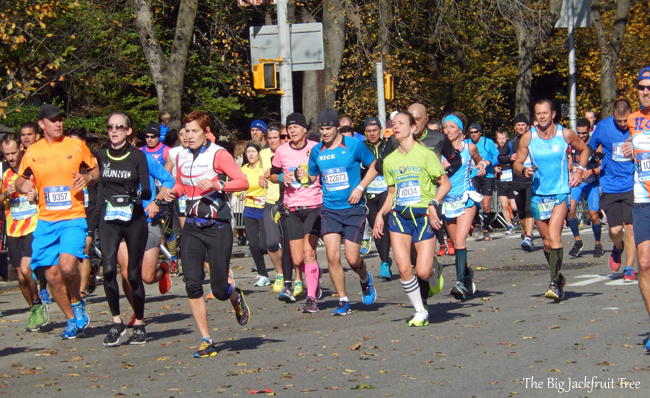 The NYC Marathon is organised by New York Road Runners and has been held every year since 1970, except in 2012 when Hurricane Sandy made landfall around that time. Demand for participation is so high that runners are selected by a lottery system. The start of the run is at 10:10 a.m, though it is regulated by a staggered start for different groups. The time limit for the completion of the run is 8 hours 30 minutes. Running time is recorded by a computer chip attached to the runner’s bib, which records the crossing of timing mats located along the course. Several TV stations in and around New York broadcast the marathon live. It can also be watched online. 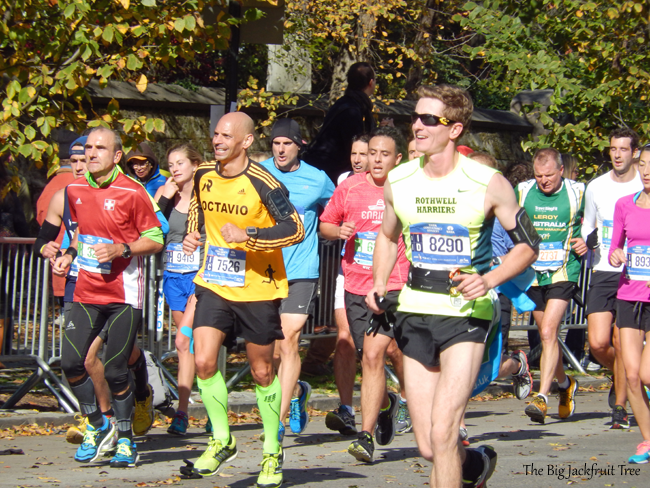 However, the NYC Marathon is not just an ego boost for the runners; it has a major economic impact as well. Through the event, millions of dollars are raised for non-profits and charitable organizations. It also generates millions of tourist dollars for New York City. 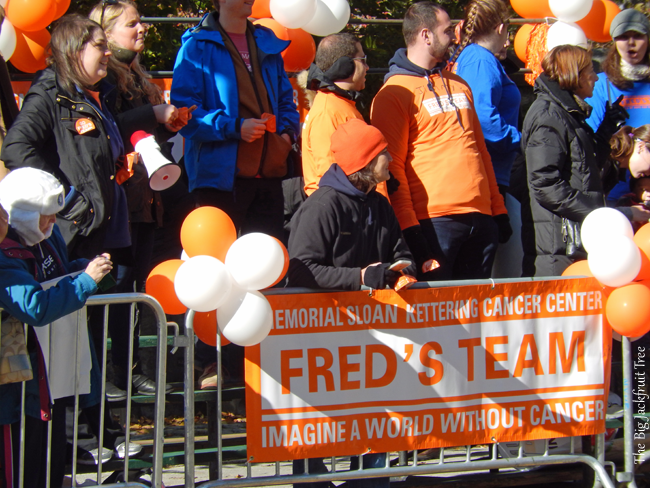 Several organizations support their own team of runners and have an active presence at the marathon over the years. 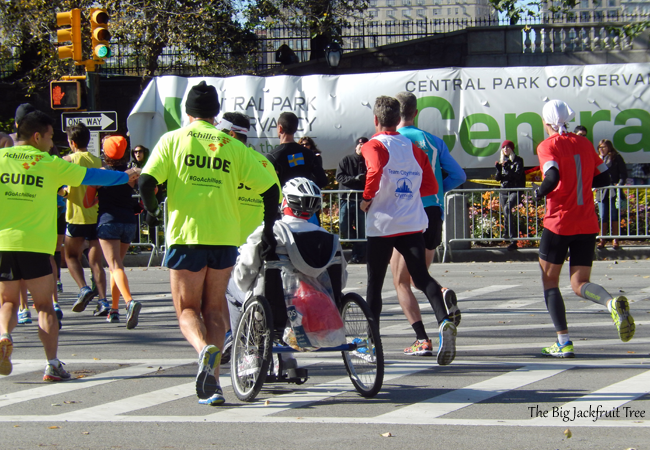 Guides running with a participant in a wheelchair to help him along. In 2000, a new official division was introduced for participants using wheelchairs and handcycles. Some of the messages on the shirt fronts of runners are quite interesting. This guy has definitely scored some points with his honey! 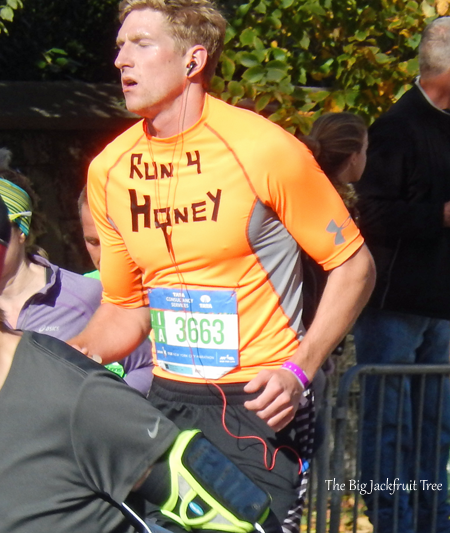 The runners have their names on their official bib and often on their shirts. We, the spectators, are encouraged to cheer by name, especially if we see someone tiring. However, we were told not to shout “almost there” as it might have a negative impact! 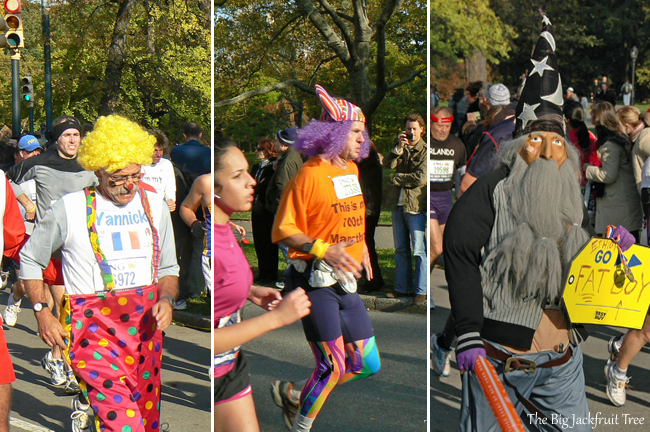 You can always see some interesting costumes at the run. 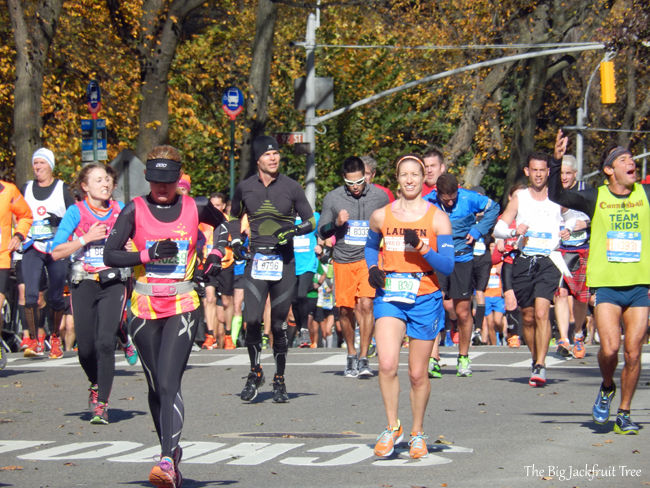 If you ever – ever – feel dispirited, inadequate, lethargic… or are on the brink of giving up on anything, all you need is a visit to the NYC Marathon to change your mood, to pick you up, to boost your candoo attitude sky high! The cheering of the crowds is enough to pick you up and hasten your footsteps even before you reach the runside! If you haven’t done so already, do add it to your bucket list! BTW, I saw my first Salvation Army bell ringer of the season today… Also, holiday muzac is on everywhere… in the malls, in the elevator, even in the train station! WooHoo! Needed a Marathon very badly. Agree that mind rots and body rusts when one stays put for long. Also the tunnel traps one within, showing no light at the end. Thank you for the timely wake up and shake up. A very good post. So here am I ready to race…..